We generally see very few games from Japan coming to Europe or the US, not because they don’t exist there but because no one is publishing them here. And translating them, obviously. Without a translation, all the Japanese games I can play would focus on the numbers one to four. With their Big in Japan series, Alderac Entertainment is finally bringing Japanese games to our neck of the woods. I learned from people who’ve been to Japan that light and quick games are very popular there, and that’s definitely the category Seiji Kanai’s Love Letter fits into. Whatever happened to lipstick-kissed hankies? Love Letter is a game for romantics. As a low-born farmer boy, you have fallen madly in love with the Princess. And why wouldn’t you, she’s young, beautiful and kind to everyone. And also entirely out of reach for you, of course. A farmer boy like you, you don’t stand a chance to ever come near her. And that’s where the story should have ended, everyone with an ounce of sense would give a sigh, admire the Princess’s beauty from afar and get on with their lives. Not you, though. You are a romantic. And so you write letters to the Princess, praising her beauty, promising your eternal love, only to be terribly disappointed to learn that your letters never reach the target of your desire. Royalty was running spam filters way before the rest of us. And that is where the story should have ended again, but as it turns our you’re not only a hopeless romantic, you’re also stubborn. You set out to make sure that your letters reach the Princess, you make friends with the people at court, from the lowliest soldier to the minister, and you get them to deliver your letters to the Princess in person. That’s when you find out that you’re not the Princess’s only suitor, up to three more romantic fools are trying to get their letters to her as well. And that’s where the story does end and the game starts. Love Letter is played with a deck of only 16 cards, one of which is removed at the start of each round to add some uncertainty. Each player only holds one card at a time, representing the current carrier of his letter. 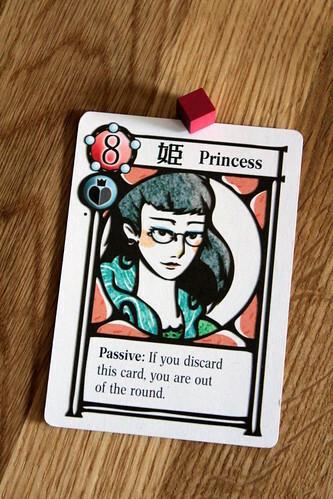 A card has a rank – the higher, the closer to the Princess that character is – and an effect to use when you discard it. On your turn, you draw one more card and then decide which of your now two cards to keep: the letter either changes hands or stays with its current carrier. The other card you play for its effect. Card effects are various and brutal, some immediately eliminate a player. However, my normal reservations against player elimination don’t apply here. In a game where a long round takes 3-5 minutes, being eliminated is not a big deal. Your downtime before the next round starts is still literally shorter than the time between two turns in many heavier games. Lets have a quick look at the cards. I promise it won’t take longer than the basic rules did. Here they are from lowest rank to highest. The Soldier: When you play the soldier, you may guess what card another player is holding. If you get it right, that player is out. I did mention the game is quick and merciless, right? The Clown: He forces a player to show his card to you. Why a Clown has a higher rank at court than a Soldier? Your guess is as good as mine, maybe the King just has his priorities straight. The Knight starts a duel between you and another player. You compare your remaining hand card with that player’s card and the lower rank is out. The downside for you: since eliminated players reveal their card, you may just have given a strong hint what your card is. The higher ranks are unique, after all. The Priestess makes you not be affected by other players’ card effects until your next turn. You can still be targeted by them, though. Few things are as hilarious as a player who knows exactly what card you have wasting his soldier on you because he didn’t see the big, obvious Priestess card. The Wizard: when playing a Wizard, you pick a player who has to discard his card and draw a new one. That player can be yourself. The General exchanges your hand with another player. The Minister has a high rank, but no effect when discarded. He does, however, have an unpleasant side-effect for you: if you’re holding the Minster and your hand cards have a total rank of 12 or higher – meaning you draw a Wizard or above as your second card – you’re out of the round. The Minister is the only significant difference between this edition of Love Letter (the Kanai Factory Limited Edition) and the Tempest edition, confusingly also published by AEG. There he is replaced by the Countess, a much kinder woman who only forces you to discard her card instead of eliminating you. Which edition you prefer is a matter of taste alone, personally I like the minister and the risk he brings to holding a high card. On the other hand, being eliminated by random card draw is frustrating. 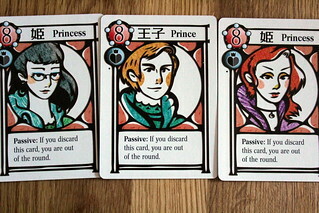 The Princess herself also has no ability, but discarding her immediately eliminates you. In story terms, she had your love letter in her hands and passed it on to someone else. That’s pretty much the definition of losing. A round ends when the draw pile is empty – quickly – and the remaining player with the highest-ranked card wins, his letter reaches the Princess. In return, she sends him a token of her affection: a wooden cube in passionate red. A handkerchief with a lipstick kiss would be way more traditional, of course, but packing 13 of those into the game box would have been impractical. Alternatively, you win the round and the token immediately when all other players are out. First player to four tokens wins. The story explanation what this means is missing. The romantics among you will obviously think that the winner marries the Princess. The cynics might consider it a victory to realize that the Princess was handing out affection candy to a bunch of people, and they might be better off with that nice girl from next door. You will of course have realized at this point that there is not a lot of meat on Love Letter. You draw a card, you play a card. Some bluffing is involved, as is some deduction to figure out what cards your opponents are holding. But it’s not exactly rocket science, even I can count 15 cards and figure out the probabilities. It should add up to a quick filler game to bridge the 20 minutes between the end of the game and the sushi delivery arriving. Or so we thought. And then it was two hours later, and we were still playing. Honestly, Love Letter is wicked fun, and when I say wicked I mean it, because a lot of fun comes from good, old schadenfreude. I enjoyed the hell out of Love Letter, even without much to think about and – I can’t believe I’m saying this – without many big decisions to make. Some turns, you just don’t think at all because you have one move that will eliminate you immediately and another that gives you a chance to survive. But with the very short turns, you’re just always involved, always paying some attention what cards are out and, half the time, laughing at someone for being eliminated in an unlikely way like being guessed out on the first turn. Or for attacking the guy with a Priestess in front of him. Love Letter is simple, but it’s simply a good time. 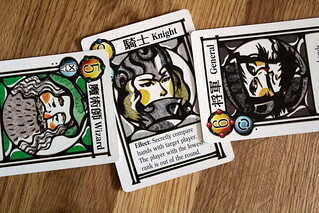 And the very good Japanese-style card illustrations do the rest to sell me on this game.